As a person, sometimes, I am an impetuous one! I use to grasp quickly the situation and respond or decide quickly on the next steps! I usually like very much complex situations because they suit me just fine! I do not like delays and I try to process everything in a single swipe (or more actually in a dedicated time slot)! That’s why I was thrilled to read the “processed once rule” presented by David Allen in his GTD methodology! It is a rule I found of maximum importance for many aspects of my personal and professional life! When One Time Isn’t Enough! Most situations in our life do not require a too much mental process. Many situations are common in your daily life and you, over the years, have developed the mechanisms and the procedures (habits, customs, experience, etc.) to handle them. As in driving, many things we have learned during the years have been “embedded” in our autonomous system and conducted in an automatic mode! The same happens in life. The new, extraordinary or not familiarized situations happen does not span in a more than 5-10% top of the situations you have to decide or take a different approach to your custom ones! You need a system to achieve maximum productivity! This small block of situations you will be called to handle are those need your readiness, your focus, and your consciousness to be handled effectively towards your favor. The problem usually lays in the fact that you have never prepared to handle any situation, at all in a consistent and structured way, which is the way you need to make conscious decisions about various subjects. The problem here is how to make decisions and if the choices around you (choices dictated by your abilities, your resources, your capacity, your environment, your habits, etc.) can help you make good decisions or not! Check yourself in a supermarket! You have a list of groceries you have agreed upon with your spouse, but coming to your favorite supermarket you find other things you would like to buy as well. And you do, and you quarrel a lot with your wife! Your decision of buying, for instance, a replacement razor set which does not exist in your grocery list it was a perfectly logical decision but contradicts, perhaps, to the money spending limitations you have agreed with your wife! So basically you have the razor set and a bad situation with your wife. The results are a lousy evening! Isn’t it? The once processed rule can save you a lot of time for doing what’s matters most! If you have followed your list all would be okay! Or not? Well, perhaps! The problem is that in the supermarket you have too many choices for too many thugs to selects from, things you have originally doesn’t think of when you wrote your list. So the “freedom” of choosing in a rich alternative environment, actually impaired your ability to choose well. This is one of the most valuable and less published keys of maximum productivity for the productivity gurus. You need more productivity, less your options on the nonimportant things and focus on what’s important! For the 80%-90% of the things we do daily, you have not to decide anything if you have prepared a little bit yourself and your environment. You should structure your life around some intentional and steady choices to help you carry yourself within your day. You structure your life around strong habits you follow without question (because you have tested them and see their value). You wake up in the same hour, you dine on the same hour, you use a limited set of healthy food you enjoy, etc. You reinforce habits you want to root in your autonomous system like reading or writing daily, listening podcasts, stop watching TV, etc. You start to develop a mindset that would eliminate the redundant decisions and further you towards your goals. You implement systems, recipes and procedures would benefit your life as a whole. You prioritize, automate, outsource, etc. other tasks to leave room for the important ones or the ones only you can do them! When you take this kind of actions, usually you never need to go back to the question or cancel your previous decisions, or choices. This is the once processed rule! The once processed rule though is not globally applicable. Because there are the other 10% of situations need your full attention and focus. These might be life-threatening situations, cases of sickness (of you or of a person you care about it), career or serious work decisions, etc. These are the case you need to be present. To pay attention. The first thing you should do about those situations, are to develop your readiness. What’s means that? You need to be the person can handle those situations to manage those situations effectively! to acknowledge quickly all the critical features of the situations and channeled them in the most favorable way. It needs preparation, planning, and experience. At the end of the day, there is nothing it can prepare you to handle effectively such situations but the life you have lived and the lessons you have drawn from it! The first thing the most experienced and skillful productivity gurus know is that there are no shortcuts or universally applicable solutions! Every solution, in productivity field or everywhere, needs to be customized to the special needs and requirements of the person using it and there is a lot of work involved to incorporate that solutions to his/her daily working routine. The second things productivity gurus do is the process once rule! The rule is simple! You pay attention only once to a specific task and you do not spend more time on it! How can that work? Let’s say you have to buy some things in the supermarket. You decide, once, on the things you need, you go to the supermarket and buy exactly and only the things on your list. No matter what! In your mail inbox, you are not “organizing” your incoming emails for future reference. You have to decide what you have to do with each mail. For instance, if you are subscribed to many newsletters, select the most crucial for you and unsubscribe from the rest. Delete whatever is not pertinent to what you do or you are never going to use it again! Use a system (as the GTD is) to organize your tasks and projects. Process each incoming e-mail just once and either archive it for future reference, or put it an action folder for doing something with it (or to a defer folder, or to a waiting for folder), or just delete it! Do not leave it in your inbox. There are much more interesting things to do with your time! NOTE: For a better mail organization you can download my free guide here! Recurring tasks that fall in an organization scheme can be easily accomplished, but when you postpone an action related to a message, a mail, a phone call, a task, this going to come back in a different form and perhaps providing different results. The “process once rule” is a valuable tool to your productivity toolbox, but is not a solution for every productivity problem! Actually, there is no a specific solution for everyone. There are solutions that work for some people and solutions that don’t. It is you that you have to find how and why you can use this rule in your workflow and how to “tweak” it to be fitted to your personal and unique requirements! You are the sole responsibility of how you can use it. You cannot live a life in auto mode. The trick here is to focus on the things that are important to you and make you a better person, husband, father, workers, associate, etc. Not to live a life without conscience! The concept is exactly the contrary! How to live a meaningful life focused on the thing are important to you and to the people you care about! Question: So what would you think? 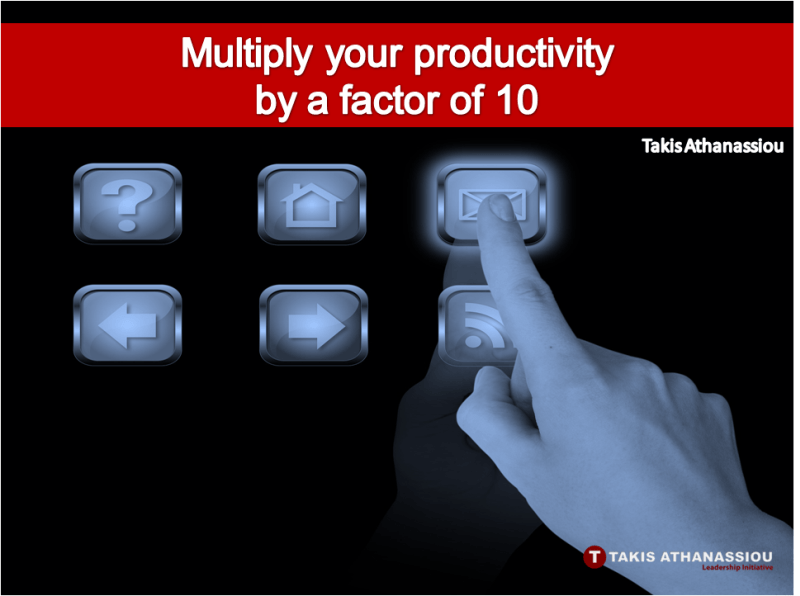 Would you like to multiply your productivity by a factor of 10? If you want enhanced productivity in your mailbox you can download my free paper on an action-oriented mailbox system! Send me your comments here?